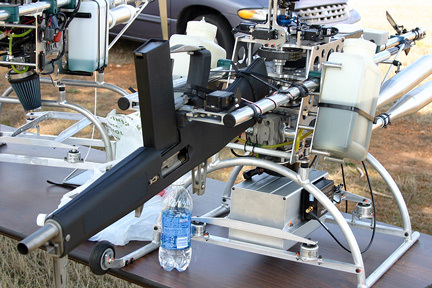 The company Neural-Robotics here in Huntsville has modified one of their AutoCopters to carry the AA-12 automatic shotgun. The AA-12 is a fully automatic 12 gauge shotgun with a 13'' barrel. Able to fire all current 12 gauge rounds along with the Frag-12 high explosive anti-armor and anti-personnel rounds. NRI has the video of the initial test. If you want to know more about the AutoCopter, there is a product briefing available here. There is also a Q&A about the AutoCopter.